We had such a wonderful visit to Jamaica in January that none of us thinks it will be our last. After all the hugs, we packed into Red Emma for the drive to MoBay airport. We stopped along the road to visit wood carver artisan Neville Blacks in Maxfield, Westmoreland, and each of us bought souvenirs. Though we had seen many wood carvers’ work throughout the week, Neville’s was my favorite — large and small pieces, unique designs, great colors. Make sure you visit his roadside shop. Sam delivered us to the airport at the perfect time, waved his goodbyes, and left us for duty-free shopping before we boarded our Southwest flight for home. Sam’s sister sent us home with ackee, sorrel, and cashews (which slowed a few of us through customs at BWI), but in all the journey home was smooth. Sorry for posting this so late, nearly a month since we returned from Jamaica. But we are still basking in the glow. Tonight we are gathering at Johanna’s home for a Jamaican dinner and reminiscing. Find us at Baltimore Clayworks for more info — we love talking about the trip. We may do it again … who knows? Email Marsha if you’d want to join in. 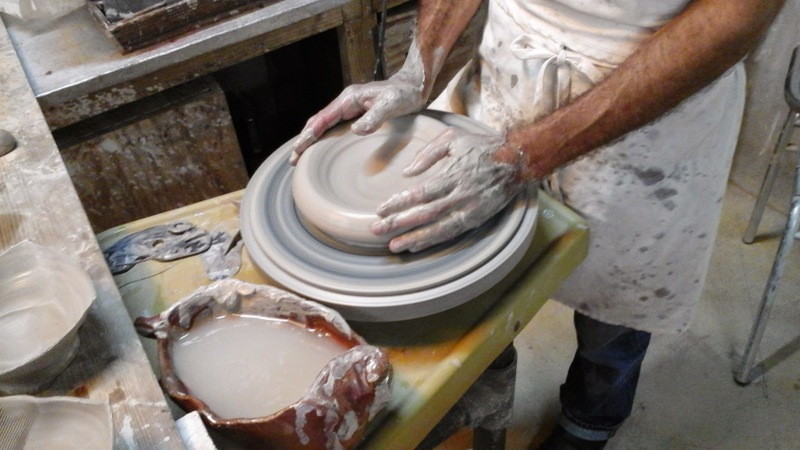 Here are some video clips of demos by David Pinto to the Baltimore Clayworks’ group on our visit to his studio in Good Hope, near Falmouth, Jamaica. See our earlier posts for more photos of his work and info about our visit.